You’ll be pleased to know that cleaning a microwave is quick and easy, even if you don’t have extensive cleaning products to hand, and even if you're dealing with baked-on food splatters. So if you’ve never been very good at remembering to cover food before you cook it, this step-by-step guide will leave your microwave looking as good as new. Here’s how to remove those exploded baked beans from the ceiling, loosen gunk and dissolve any food residue, leaving your microwave sparkling and completely odour free. Use our kitchen cleaning hacks for more handy tips. Want more handy cleaning tips, advice, and hacks? Check out our cleaning hub page. Safety first: When cleaning your microwave, always wear rubber gloves to protect your hands and if you’re using any commercial cleaning products ensure you read the instructions fully before use. 1. Fill the microwavable bowl with 200ml of water and add two tablespoons of white vinegar. Place a toothpick into the bowl to stop the water from boiling out over the edges (bubbles will form on the wood so the water can boil without exploding). Shut the door and run on high for five minutes. 2. When the timer goes off, don’t open the microwave right away. Leave the door shut for five more minutes to let the steam continue to work. The steam will help loosen caked-on bits of food and the vinegar will help eliminate any odours. 3. When you open the door, be careful pulling the bowl out; it will be very hot! Remove the turntable tray carefully, it will be hot as well and wash it in the sink in soapy, warm water. 4. Using a sponge scourer wipe down the inside of the microwave, the door and the ceiling, the dirt and food will come right off. Allow to dry with the door open. This method will help a microwave that's a bit smelly be much fresher, too. Use our guide to getting rid of household smells for more handy tips. 1. Another handy microwave cleaning hack is to follow the method above, but swap vinegar for a whole lemon. Simply cut the fruit in half and squeeze the juice from one half into 200ml of water. 2. Place both halves of the lemon, leaving the rind on, into the water. 3. Turn the machine on high for five minutes allowing the solution to boil and make the window steamy. 4. Lemon juice is a natural cleaning agent so all you have to do is wipe inside with a sponge afterwards. Check out more cleaning hacks that don't actually use cleaning products. For any stuck on, spattered food you might find on the walls or ceiling use a scourer dipped in hot, soapy water or spray the sponge with kitchen cleaner. You can wash most removable pieces, like the turntable, in the dishwasher or in a sink of soapy water. Just make sure you read the manufacturer's manual before you remove any intricate parts from inside. Clean the rubber seal around the door thoroughly with a sponge dampened with warm, soapy water. If the window is greasy, spray an all-purpose cleaner onto a wet sponge and scrub away any residue. Don’t spray any cleaning solution directly onto the microwave as you may risk getting cleaner in the vent holes. Instead, spray on a wet cloth or sponge and wipe all over the surface. Dry off with a clean paper towel and dust with a duster. If yours is an on-show stainless steel microwave, use our guide to cleaning stainless steel to find out more. In order to make it easier to clean your microwave next time wipe the inside of your microwave every couple of days, depending on how often you use it. Try and remove any splattered food as quickly as possible, it’s easier to remove when the food is warm and yet to congeal. Always cover your food before cooking using something like a anti-splash plate cover. Avoid using strong chemicals, such as bleach to clean your fridge. Why? Well, products like this don't mix well with food – if you don't rinse the microwave thoroughly after you've cleaned it with bleach, your food will taste of it. Another good reason? Some manufacturers advise that the bleach makes any plastic components within the microwave brittle over time. Find yourself a new microwave oven with the help of our buyer's guide best picks. Small kitchen? 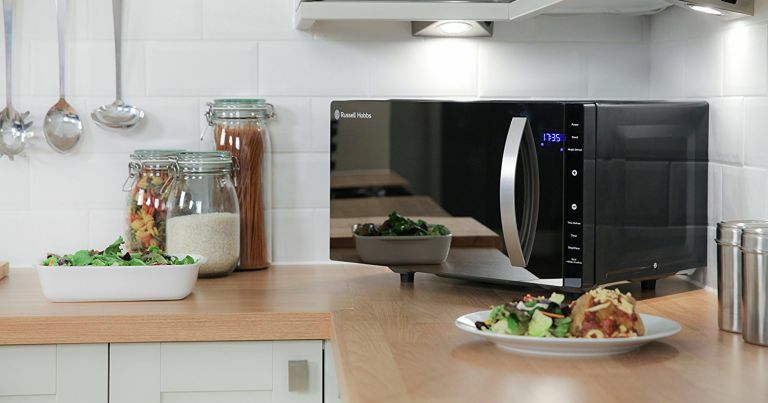 No problem – we've found the best small microwave ovens to fit right in.